Dear, Sir / Madam. You are cordially invited to read the following review about a 92 minute movie made in 1964. 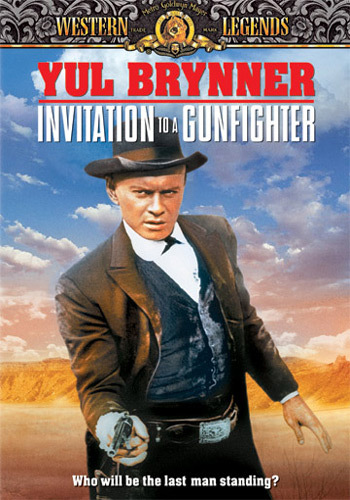 It was Directed by: Richard Wilson; and it Stars: Yul Brynner, Janice Rule, with George Segal. Or alternatively, if you don't want to read this review, why don't you go and f*ck a fifty foot horse you bug-faced a**-wh*le. Many thanks. Now as much as I enjoy the pleasure of your company, Ms Adams (Janice Rule), I can't help but notice that you seem to have something plaguing your mind. But what could this possibly be, fair lady? Could your concern be directed towards your ailing husband, Crane Adams (Clifford David)? Largely due to his current drunken state! Or then again could your concern be related to what Sam Brewster (Pat Hingle) has hired me to do as soon as I came into town? Specifically, kill Matt Weaver (George Segal), because he murdered a man after finding out his property was stolen from under his own nose! Ah-ha! I'm right, aren't I, Ruth? I can see it in your eyes. You have feelings for Matt, don't you? Special feelings. And I presume you want me to relinquish my bounty for the sake of truth, justice, and all of that cr*p.
Well, I suppose to some extent I can see where you're coming from, my dear. Like you, I'm also a person who has a very conflicted temperament. Whilst one part of me wants to shoot people, get drunk, and gamble with cards. Another part of me really admires what you're trying to accomplish. And that's most probably why what next transpires all kicks off when you say to me, 'Jules (Yul Brynner)! Please try to look after yourself'. 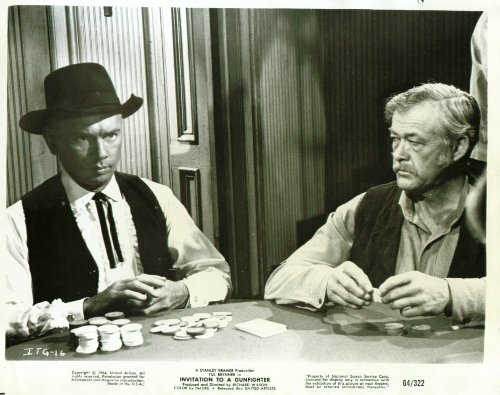 As a gunfighter suddenly changes his spots - a local villain scrambles to join the dots - a town gets smashed up by a sullen drunk - and at the end of the day, some justice is shown in spite of the junk. 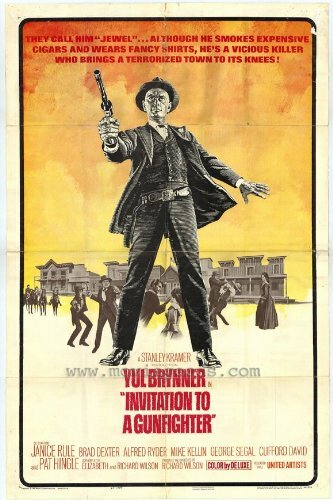 Now if you're one of those people who enjoys a good solid western jam packed with emotion, action, and suspense, then boy-oh-boy, 'Invitation to a Gunfighter' is surely a film for you. On a narrative level I'd say this was the type of picture where the conceptual premise dictated the emotional plot. For instance, at the start of this film you can't help but feel sorry for the character played by George -- mainly because he's lost his love, his home, and his family roots. 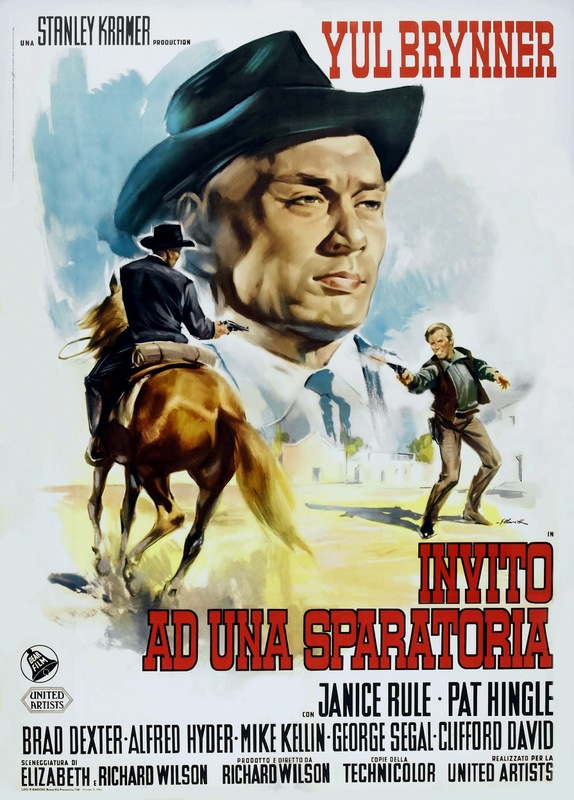 Twenty minutes later you feel even worse for George when Yul Brynner's character comes into town -- and this, in turn, is attributed to the local villain's hiring him to kill George, as well as the suave and menacing way Yul ultimately presents himself. Then another twenty minutes later comes a rather unusual twist. A twist that takes the form of a key plot-device that is at the very center of this film -- Janice's character -- who seemingly acts a sounding-board and an emotional anchor to the main characters surrounding her. Also, something else about this great film I best mention is how I thought Yul's performance -- which was amazing by the way -- reminded me of a number of other notable performances throughout cinematic history. In my eyes one part of him came across very regal and precise in statue, just like Lee Van Cleef did in 'For A Few Dollars More'. Another part of him felt very mysterious and spiteful in tone, similar to Clint Eastwood's role in 'High Plains Drifter'. And finally there was yet another part of his persona which was very much like Yul himself -- stoic, brave, and very physically acrobatic on his feet. Now in addition to these positive attributes I would also like to applaud the very humble message that this movie tries to convey. And no, it wasn't one of those clichéd messages about the solemn path of a lone bounty hunter -- even though that was tucked away in there somewhere as well. The message I'm refereeing to is the one concerning the slave trade, folks, and how it wasn't until people of note took a stand against this racial confinement that it was finally abolished. Anyway. By now I'm sure you know what I felt about this film. It's a great-great film, and these are its filmic facts. (1) 'United Artists' first release this $1.8 million dollar production on the 14th of October, 1964, and eventually clawed back $3.1 million dollars at the box office. (2) Loosely translated, this project was entitled 'The Challenge Gunfighter' in Finland; 'Bandit Wanted' in Hungary'; and 'The Mercenary Midnight' in France. (3) This film was adapted from a 1957 teleplay written by Larry Klien, first shown on CBS's anthology series, 'Playhouse 90'. (4) One of the taglines used to promote this picture, was, 'He's A Vicious Killer Who Brings A Terrorized Town To Its Knees!'. (5) The majority of this movie was shot at Universal Studio's 'Mexican Street Backlot', which was situated within the American state of California. Also, on a side note, the 'Sam Brewster home set' was the same 'home set' used in the 1960 Alfred Hitchcock thriller, 'Psycho'. (6) Regrettably this was the last known film appearance by the venerable television actor, Stan Jones. (7) Hal Goodman, who was one of the writers assigned to pen this flick, has also written for such prime-time American television shows as: 'The Carol Burnett Show', 'The Jerry Lewis Show', and 'The Milton Berle Show'. (8) After this adventure threw down its holster, Yul Brynner starred in the naval-drama, 'Morituri'; Janice Rule starred in the television series, 'The Reporter'; and George Segal starred in war-time comedy, 'Ship of Fools'. 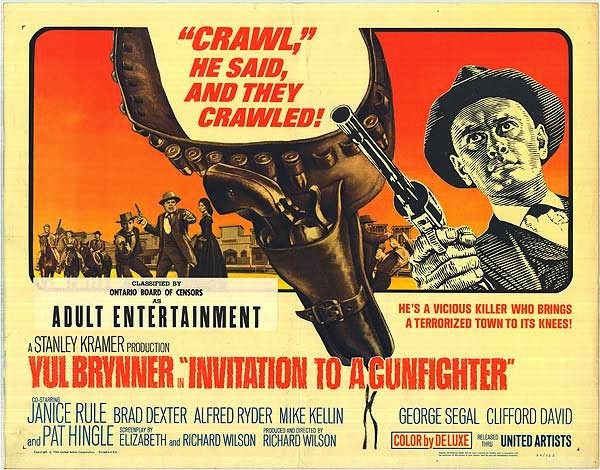 Overall I'd say 'Invitation to a Gunfighter' was a way above average western for its time. The story-line was an emotional one in temperament. The actors did a pretty good job of juggling the plot. And all in all -- yeah -- good job -- and I can't wait to see what other western movie I have in store next.